The Retinette 1B was a very popular camera made by Kodak during the sixties. An evolution of the Kodak Retina designed for the general public, the first Retinette appeared in 1939. The first versions were folders. The Retinette became a rigid camera in 1954 with the 1A model. The 1B appeared in 1960. The one on the picture was made in 1966. Fitted with a 45 mm f/2.8 Rodenstock Reomar lens (a triplet originaly designed by Schneider-Kreuznach), the Retinette 1B has a coupled Gossen selenium light meter with a needle display in the viewfinder. The finder has a collimated frame with parallax indication marks. The shutter gives exposure times from 1/500 s to 1/15 s plus B pose and flash synchronisation. It uses a hot shoe, making the synchro-cord optional. The Retinette has no rangefinder but focusing marks on the lens. It is not very accurate. 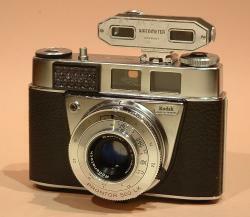 The model shown on the picture has a Watameter II external rangefinder mounted on the flash shoe. The Retinette was a very popular camera.